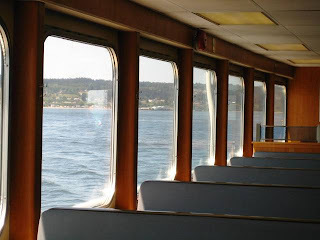 The Ferry Riders Opinion Group really wants to hear my thoughts on Whidbey Island ferry runs. Every AM, another survey invitation in my inbox. I’ve been deleting them because several friends who ride the ferry much more than I do have shared their opinions with the decision makers. Those opinions cancel each other out, so I figure whatever the system has already decided will happen. Cynical or realistic? Your call. 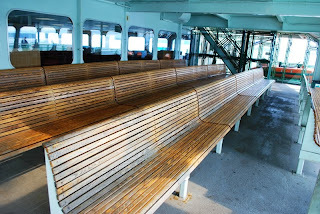 I like our Puget Sound ferries, I’ve always liked them, from the old Kalakala, to the Superferries of the 70s, to the foot ferries, so I’m sure I’ll like whatever comes next. Barring a few of them sinking due to pitted hulls. That I wouldn’t much like. Outdoor benches, favored for privacy during those cheap dates. No one else wants to freeze their @$$#$ off. 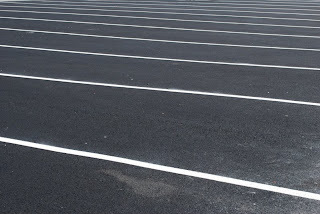 Stripes on the overflow lanes at Mukilteo replicate waves. Poor marketing is the problem for the ferry system at the moment. Everything they do seems to rile up the customers who, judging from the news coverage of the decisions made, are never right. And now the problems are compounded by budget woes that drive management to talk about cutting back on the number of runs per day, or instituting a reservation system. I’ve not got an opinion about those. Any choice will have good and bad repercussions, staying the course will have good and bad repercussions. My opinions tend to focus on more mundane things like personnel and maintenance. The crews can be a mixed bag – for the most part deck hands are friendly and know their job, but now and then I get confused by one of them doing something that looks more like the hula than traffic direction. That’s irritating. Then there’s the gate keeper with an attitude, who arbitrarily decides to close the gate and sail a half-full boat, leaving one car or one lone foot passenger stranded for an hour until the next sailing. What’s up with that? Not good PR. And those stupid new video advertising screens. Those were a bad idea. So were the State Patrol car searches, which became little more than arrogant posturing during the Bush years. Lately they seem to have been re-framed as dog training exercises, which makes them more palatable. But these aren’t the questions management is asking. Whatever happens with service reductions or reservations, for me the ferries will continue to be a romantic adventure. Even after riding them almost daily for twenty years I look forward to every crossing. Our beautiful white and green boats will never be a nuisance. But please, do maintain those hulls.